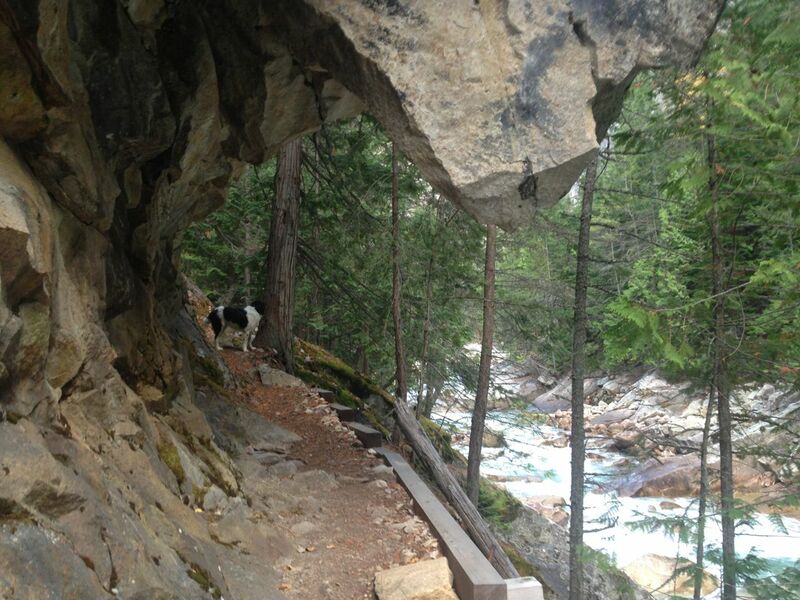 Perhaps my favorite day hike in the West Kootenay. Fry Creek Canyon demands perseverance, in the form of an 1 1/2 drive from Nelson to the seldom visited NE shore of Kootenay Lake between Argenta and Johnson’s Landing. The hike is well worth the drive as you receive crystalline pools, canyon breezes, torrential cascades, ferny cliff faces as trails hug the canyon edges near acrophobic bridges in crisp Douglas Fir forests with friendly tour guides named Bosco. And the round trip is around 3 hours. The trail up the canyon has been disturbed by a mudslide and you must navigate the creekbed to ascend up a ladder to regain the trail. Do not attempt during spring runoff or while creek is in spate. Bosco will probably meet you, he’s a huge friendly brute who will keep the bears away for the price of friendship and a few slices of cheese. Pacific Yew tree. Poisonous but offers anticancer potential. Fry Creek Canyon Bridge. And Bosco. Up valley. The trail beyond this point has been interrupted by a landslide. A ladder has been installed, but Bosco cant climb it. The trail is impassable when creek is in spate. It’s really amazing around there. Kootenay Lake is a magical place, check it out if you ever in Canada!